PRESENT: Catherine J. H. Miller, Ikie Kressel, Jan Carpenter, Joan Glebow, Karen Swallow and Susan Russell. Our host Janet Amundson-Splidsboel you can contact for a open life drawing (from the figure) at janetsartstudio@gmail.com. She offers drawing once a month. She calls it “ The candlelight group” $8 a session and the events go 5-8pm and there are 5 25 minute sessions of the same pose each night. Guests will share wine and treats that they the artists bring. Host Janet Amundson-Splidsboel’s shared her encaustic painting and her great studio open studio coming up soon….. check it out… “Open Studio” on line. Janet told the group that submissions are being accepted to Oregon Society of Artists (OSA) for a show where artists buy 12×12 wooden panels from OSA. The they must submit them with pricing under $200. to learn more go to www.oregonsocietyofartists.com. 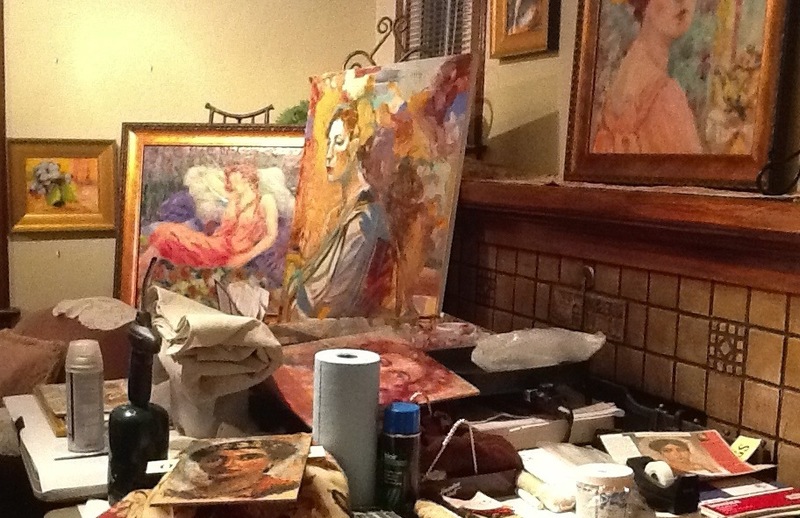 Janet shared some of her art on the walls of the house that she takes as her studio. And about process of just producing art, and some about her history with Madeline and seeing the OWCA grow into a impressive organization today. Madeline was her mentor, and was responsible for helping Janet in developing her confidence in producing art. 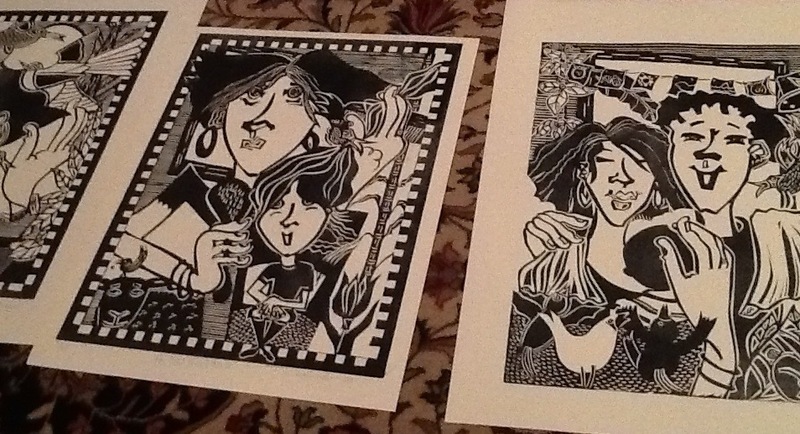 Ikie reported that Mark Mahafey master printer was in town and in her studio with her. She shared that she has spent some time working on getting a solid blacks from her linoleum block prints to no avail and hoped he could help. Ikie brought 3 test proofs of three different blocks to show the issue with the blacks and discuss her work for two upcoming shows. The master printer helped her to make the change in linoleum from some stuff she’d been using to supplier Daniel Smith out of Seattle who has the better type which she’d used before… It was higher quality not like the cheaper one as she had been using. Ikie shared A large print she made for the OCA [WCA?] show “Sky”….. then a second one same size with same type of checkered border titled “French braid”…. Ikie says it speaks to the mothers….. Third lage print same size no boarder was made more recently “post new grand baby in the family” Ikie says….. group discussion included appreciation of the symbols like fingers and pushing the boundary of commercial work. Karen Swallow had a small announcement for the Madeline Award presented by Presidents Catherine to Joan Glebow and Una Kim this year at the PCPA OWCA showcase show artist reception. and said that this is being written up and sent to publications…. Norma one of Madeline’s best friends…. Helen Ford possible show for Madeline’s stored work…. There will be a show for her looking for a grant for the show to be framed…. For a show…. There is the submissions for the Audubon show…. 6×6 donated art show bird only one piece…. Karen shared her Sumi ink with waxed paper. then the group talked about paper. She said that this work or her work is or will be hanging Mooreland Frame shop. Jan Carpenter sh ared a new sculpture piece made from welded steel which is in mid process. 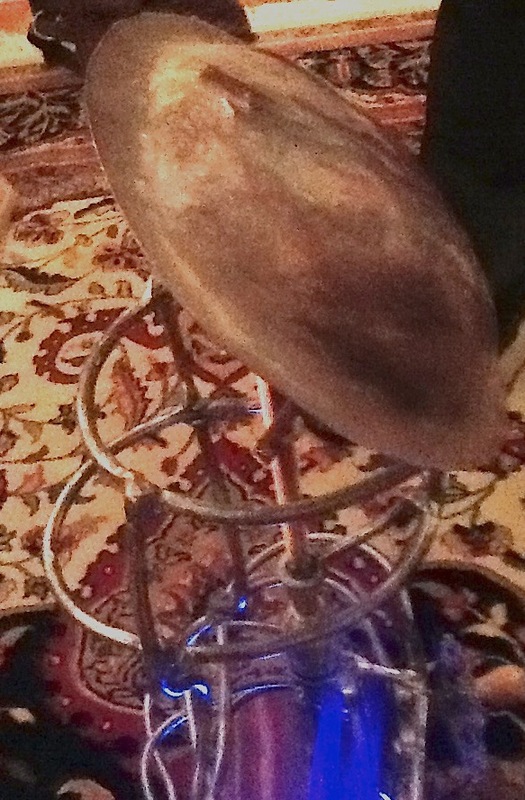 She wanted input about the LED lighting in the base of her work, and different applications/treatments for the elements. Discussion on scale color and possible solutions took place. Jan spoke a bit about her recent travels to south America. She may be writing a book using this and other short stories possibly set a touch in the future. Bunch of short stories could use as a vignettes. group ask about if she was painting she said yes but not much at the begining of the year. But you can see her art at http://catherinejhmiller.wordpress.com and on http://asomewhatsecretplace.wordpress.com/ her book on disability and art that she wrote earlier in the year. The story she read was from a”Write around Portland” group who then also published her work. She felt the publisher edited too much out of the story leaving a large part of a page empty when it did not need to be. She felt censored and the work was feminist. Catherine then shared her next project , paintings of 30-50 cat beards viral photos on the internet. project to be done 2014. 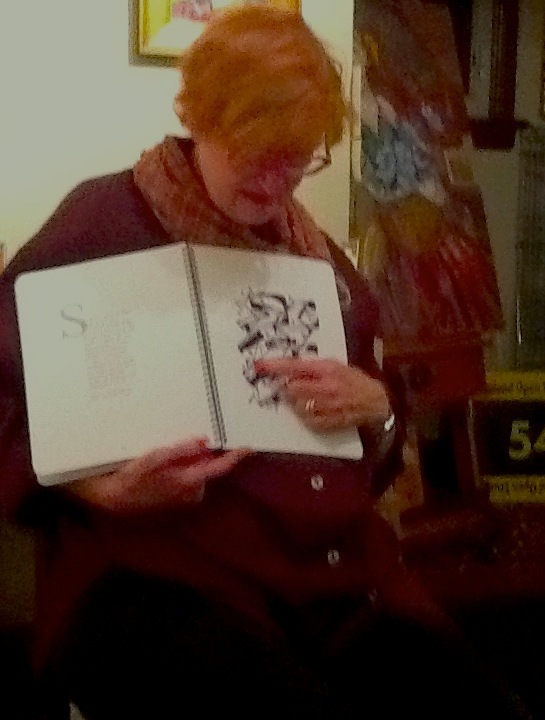 Joan has been drawing self portraits in top bound sketch books with favorite pens that are just right. Meaning, that they are sort of running low on ink so that they make some smoke on the page. going through her stuff to decide what to keep and what to let go into universe. There was a lot of enthusiasm Where she shows emotion through herself portraits…. Susan Russell is a new artist in town and new member to OWCA in 2013. She said to the group how happy she was to be a part of the OWCA and meet everyone. She shared her published book `Book about letters,” (note: not sure on title) which is a history of letters and is a collection of illustrated letters. Her work and she where warmly welcomed. She read for her book the letter Z page. And she flipped through the book. You can buy the books from her directly. She would like more opportunity to share the book with schools and communities so contact her if you are interested. Enter your email address to subscribe to the OregonWCA blog and receive notifications of new posts by email.